The parish council is aware that several streets on the Coopers Edge site have a poor broadband speed (less than 30 MBps). So we want to put pressure on Fastershire to include these streets in its plans to bring a super high speed fibre optic service to the majority of homes in the county. · Go to Hucclecote Parish Council’s Facebook page and add your name, house number, and street name. · The more we get the better chance we have of getting Fastershire to do something – so tell you friends and neighbours and share this across any other social media that might help. And if you know of any lists/petitions or whatever that may already be circulating please take a photo of the list and post this to us via Facebook too. · We need this information by close of play on 16 July. 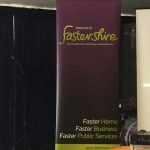 The Parish will then write to the chief executive of Fastershire urging them to include all the homes on our list in its programme of works. We may also ask everyone to send their own letters to them too (we’ll provide a sample that you can adapt) . If Fastershire’s post box is awash with letters from disgruntled residents it will add extra pressure. POTENTIAL SOLUTIONS TO THE POOR BROADBAND ON COOPERS EDGE?